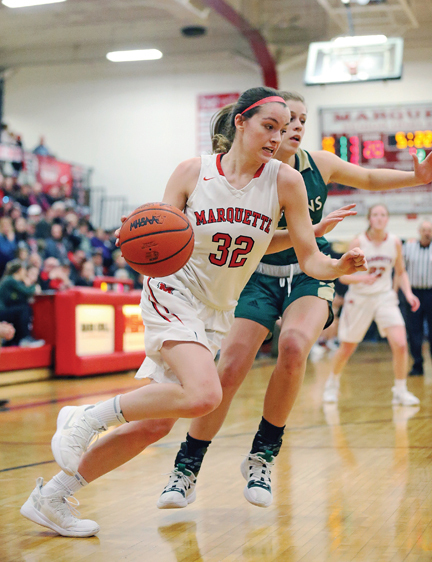 MARQUETTE — Marquette seniors Avery Ledy and Sophie Bartlett were able to double dip when coaches in the Great Northern Conference voted on girls basketball postseason awards on Tuesday. Ledy, a 5-foot-11 forward, was the big winner, however, taking home both Player of the Year and Defensive Team honors. Bartlett, a 5-8 guard, also made the Defensive Team while adding in honorable mention. And their coach, Ben Smith, was named the conference Coach of the Year after he not only led the Redettes to a perfect 8-0 GNC record but had the only team with a winning GNC mark. And to boot, his team won an MHSAA Division 1 championship in a district tournament based in the northern Lower Peninsula. Several other MSHS players also earned honors — 5-9 senior forward Sydney Kivi made the First Team, 6-foot junior center Madison Carter and 5-10 junior guard Aspen Michelin earned a spot on the Second Team, while 5-10 senior forward Kayley Elmblad won honorable mention. Gladstone’s Andie Belanger, a Second Team honoree, was also voted the league’s Defensive Player of the Year.